This past Sunday in Australia, the film and conservation communities lost a well-respected member. Ron Taylor passed away at age 78, after a two-year battle with leukemia. 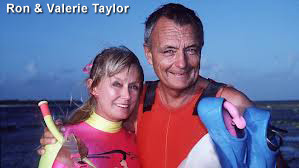 With his wife, Valerie, the two were internationally renown for their work over the years with sharks. Ron first came to prominence with his work on the early shark film, Blue Water, White Death - one of the first films to focus on the great white shark at a time when those magnificent predators were shrouded in mystery. Ron was a still photographer and cast member in that classic documentary. What really propelled Ron and Valerie's collective careers was the work they did for Steven Spielberg's Jaws. Having seen some of their work, Spielberg enlisted their aid and expertise in filming an actual great white in close proximity to a small 3/4-size shark cage (thereby increasing the apparent size of the shark to match the monster shark of the movie). It's documentary film legend that the shark they filmed became caught up in the lines holding the cage and the thrashing of the shark to free itself became an unexpected bonus to what was already a very dramatic scene. However, in some circles Ron was criticized for providing that footage, accused that it helped to demonize the shark and add to the myths and misconceptions people had at the time regarding sharks. Ah, but that's the point. In the early 70's, sharks were not being intensely studied. They were considered to be mindless, vicious predators even by respected ocean experts. Jacques-Yves Cousteau is seen in one of his own television programs shooting sharks with a rifle from the deck of the Calypso, declaring them to be devilish creatures up to no good. 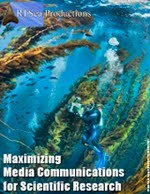 Nobody understood or appreciated sharks then the way many of us do today, but their viewpoint was simply based on the available information at the time. The interesting benefit that Peter Benchley's book, Spielberg's film, and Ron Taylor's camera work on Jaws did for the species was that, besides scaring us, it pricked our imagination and our fascination. And from there, both scientists and laymen set about wanting to learn more. And ironically, in the aggregate, sharks have been the better for it. Many of you who read this blog know of Ron's work and may even call him a good friend. I only had one brief opportunity to meet Ron Taylor so I cannot say I actually knew him, but it was clear that he and Valerie were an adventurous, dedicated and enthusiastic team. 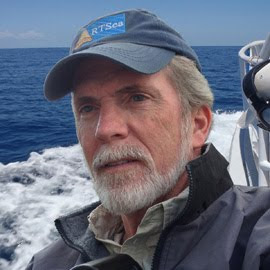 Ron worked tirelessly on behalf of shark conservation, partnering with groups like Rodney Fox's shark conservation research group, and he continued to be involved in a variety of first rate ocean and shark documentaries. Ron Taylor's was a career built on adventure and unlocking secrets so that people around the world could be mesmerized by life under the sea. Knowledge is the first step towards appreciation and conservation. We have lost another filmmaker and teacher.